The trip so far has been very exciting -- both for JPEF and me personally. South Africa is a beautiful country and I feel lucky to be here. I arrived in Durban, after a very productive week in Cape Town. There I met with Richard Freedman, the director of the South African Holocaust and Genocide Foundation, and his amazing staff who were so grateful that JPEF was in town with our exhibit. It has up at their Centre for a week already, and I was in town to teach their docents on how to present tours of the exhibit, show local teachers on how to teach with our materials, and give a couple lectures to groups of students. Here is link to some of the programs from the Holocaust Centre regarding my visit. My first program was with 350 students from Herzlia High School -- a Jewish school in the hills above the city. I gave a PowerPoint student presentation and showed JPEF's "Introduction to the Partisans" video to a very engaged audience. I then had some excellent questions -- including one 12th grader who asked why I could be proud of the partisans as they were killing people. This opened the discussion that when people are resisting genocide they do not have many choices -- boycotts, hunger strikes, and work stoppages would not have stopped Hitler. We discussed the concept of "tactics" when resisting, and how the tactic chosen to resist needs to match what people are resisting. For instance, when Dr. King and Gandhi were fighting for civil rights they chose non-violent resistance and were successful. Violent resistance is only a last resort. This will be a topic for a future JPEF study guide. Students at Herzlia High School in Cape Town watch JPEF film, "Introduction to the Partisans"
I also spoke to a group of educators, using our "Living and Surviving in the Partisans" and "Women in the Partisans" curriculum and films as the basis for the workshop. 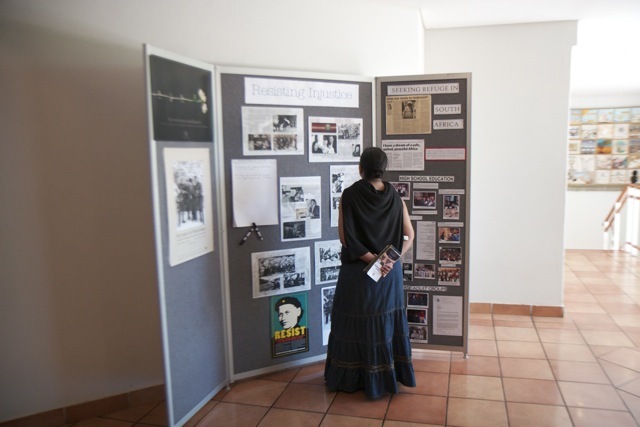 The educators appreciated the connection between the partisans resisting and those who fought against Apartheid. Our work has special meaning here. One educator said, "Maybe be one could draw a comparison of the partisans and those of guerilla fighters in SA [South Africa] and let learners debate the importance of resistance." Through our new relationship with the Holocaust and Genocide Foundation JPEF will now have the opportunity to get our materials into the country's official 15 hour curriculum on the Holocaust taught to all 9th graders. This can ultimately effect millions of young people here. There is still a lot of work to do to make this a reality. We are excited at the opportunity. I also spoke to a smaller group of students from the school -- running our "Ethics of War" program where we read JPEF play "Conversation in the Woods" . 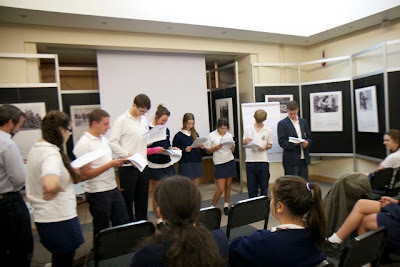 Students from Hetzlia read the JPEF short play, "A Conversation in the Woods"
The big presentation I was here to do was for the UN Holocaust Memorial Day commemorations to almost 200 people. I was honored to be the keynote, with UN Information Director from Pretoria giving a message from the Ban Ki-moon, Secretary General of the UN before I spoke. The theme the UN chose this year was on women in the Holocaust, so I tied everything to our Faye Schulman exhibit and showed clips from our "Women in the Partisans" short film in addition to video clips from Faye. It was a great match for our material. 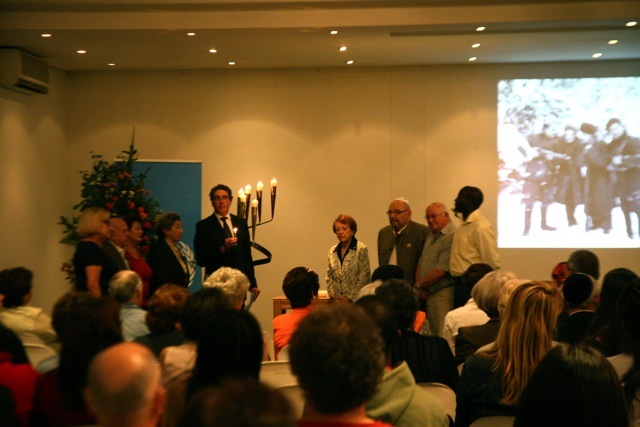 Richard Freedman conducts UN Holocaust Program at Cape Town Holocaust Centre with local survivors. The exhibit will attract hundreds of people to the Centre. Already several classes are making special trips to see the exhibit -- both private schools and State schools. They will also use our materials and discuss the partisans as part of future tours of their permanent exhibit which is quite impressive in itself. Here is panel they had set up with our material outside of where the exhibit is staged. Tomorrow night I am the keynote at a Holocaust program in the port city of Durban, then I teach teachers and docents Monday. 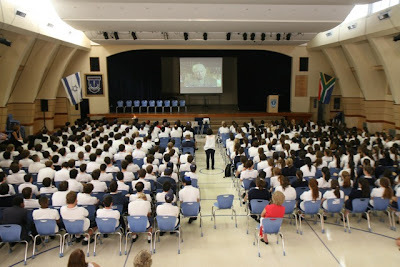 Tuesday I am off to Johannesburg to do much of the same, but will stop at a State school to speak to 150 kids there as well as a Jewish High School. Our exhibit will be touring the country though March and will reach a few thousand people. The programs I am doing with teachers and staff of the Holocaust and Genocide Foundation will ensure the history and life lessons of the Jewish partisans are taught in South Africa for generations. I want to give a special thank you to our funders and to curator Jill Vexler who made this all possible. Of course, we would not even be here unless it was for the generosity of Faye Schulman, who has trusted us to take her beautiful photographs to the world. Thank you Faye. Jewish partisan commander, Frank Blaichman, recently had his book, Rather Die Fighting, published in Poland. January 24, 2011 (MMD Newswire) -- On 27 January 2011, the United Nations Department of Public Information will honour women at the sixth annual observance of the International Day of Commemoration in memory of the victims of the Holocaust in a ceremony, to be held in the General Assembly Hall from 10 a.m. to noon. This year's observance will focus on the theme "Women and the Holocaust: Courage and Compassion", and will pay tribute to the bravery and ingenuity of the women who faced Nazi persecution with strength and dignity during the Second World War. "Jewish women performed truly heroic deeds - in the face of danger and atrocity - they bravely joined the resistance, smuggled food into the ghettos and made wrenching sacrifices to keep their children alive. Their courage and compassion continue to inspire us to this day," said United Nations Secretary-General Ban Ki-moon. Hosted by Kiyo Akasaka, United Nations Under-Secretary-General for Communications and Public Information, the ceremony will open with a message from the Secretary-General. Statements will be made by Vice-President of the General Assembly; Francisco Carrión, Permanent Representative of Ecuador to the United Nations; Susan Rice, Permanent Representative of the United States to the United Nations; and Meron Reuben, Permanent Representative of Israel to the United Nations. The keynote speech will be delivered by Lenore Weitzman, Professor Emeritus of Sociology at George Mason University, who has devoted her career to advocating for women's issues. She co-edited the book Women in the Holocaust (1999), and is now completing a book on the "Kashariyot" - the young women that served as secret underground "couriers" for the Jewish resistance movements in the ghettos. Also featured in the memorial ceremony will be Nesse Godin, a Holocaust survivor, originally from Lithuania. As a child during the Holocaust, Mrs. Godin survived a ghetto, concentration camp, four labour camps and a death march. Mrs. Godin has dedicated her life to teaching and sharing memories of her horrific experience and serves as a volunteer at the United States Holocaust Memorial Museum. Ádám Banda, a renowned concert violinist from Hungary, will perform, and Cantor Yaakov Lemmer, Chief Cantor of the Congregation Anshe Sholom, will recite the memorial prayers. Three young students from the United Nations International School, Tinglan Cao, Boteng Maluke, and Gabriela Ruiz Pez, will read excerpts from a diary and letters of women who perished in the Holocaust. In the afternoon, there will be a panel discussion held by B'nai B'rith International, entitled "The Survivors, 1945-2011: Struggle and Perseverance" and a round table organized by the Permanent Mission of the Russian Federation, entitled "A World Without Nazism - A Global Goal for Humanity Today and the Sixty-fifth Anniversary of the Nuremberg Trials". This event is co-sponsored by the United Nations Department of Public Information, the International Human Rights Movement "World without Nazism" and the American Forum of Russian Jewry. The week-long events in New York will include the opening on 24 January of the exhibition "The Memories Live On", which features drawings of Auschwitz made by an unknown prisoner of the concentration camp. This exhibition is sponsored by the International Auschwitz Committee in Germany, the State Museum of Auschwitz-Birkenau, the International Youth Meeting Centre in Oswiecim, Poland, the German Resistance Memorial Centre in Berlin, Germany, the Permanent Mission of Germany to the United Nations and the United States Permanent Mission to the United Nations. The exhibition "Hélène Berr, A Stolen Life", curated by Mémorial de la Shoah in Paris, France, will also be displayed in the United Nations Visitors' Lobby. This exhibition, based on the diary of a young Jewish girl, documents the persecution of Jews in Occupied France during the Second World War (see Note No. 6291). Other events include a screening on 25 January of the documentary film Daring to Resist, produced and directed by Barbara Attie and Martha Goell Lubell and distributed by Women Make Films. The film recounts the stories of three young Jewish women who found unexpected ways to fight back against the Nazis. The screening will be followed by a discussion with Frank Blaichman, a former partisan, whose presence was made possible with the help of the Jewish Partisan Educational Foundation, and Bonnie Gurewitsch, an archivist and curator at the Museum of Jewish Heritage - A Living Memorial to the Holocaust, New York City. Around the world, United Nations Information Centres (UNICs) will also commemorate the Day with screenings of this film, memorial ceremonies and educational activities with local schools. The United Nations Holocaust Programme and the Mémorial de la Shoah produced a travelling exhibit in English, French, Russian and Spanish, which will be hosted by Information Centres in Bujumbura, Dakar, Manila, Mexico City, Moscow and the United Nations International Service in Vienna. For more information on the Mémorial, please visit www.memorialdelashoah.org. In line with this year's theme, the United Nations Holocaust Programme also produced an educational study guide and companion DVD for high school students, entitled Women and the Holocaust: Courage and Compassion, to help youth better understand how the Holocaust affected women. The materials were developed in partnership with the International School for Holocaust Studies at Yad Vashem, The Holocaust Martyrs' and Heroes' Remembrance Authority, and the University of Southern California Shoah Foundation Institute for Visual History and Education. The study guide and DVD can be downloaded from the Holocaust programme's website and will be available in all United Nations official languages. For more information on these partners, please visit www.yadvashem.org and www.usc.edu/vhi. All guests must pre-register to take part in the events at New York Headquarters. Photo identification will be required and seating is on a first-come, first-served basis. Please see the Programme's website www.un.org/holocaustremembrance for registration details and www.un.org/media/accreditation for media accreditation. The Holocaust and the United Nations Outreach Programme, whose mandate is to educate the public about genocide, is collaborating with JPEF on its International Holocaust Remembrance Day on January 27th. In New York City, a screening of the documentary film Daring to Resist, which profiles three young Jewish women during the Holocaust--including Faye Schulman Jewish partisan photographer--who found unexpected ways to fight back against the Germans, will be part of a week long observance commemorating the memory of the victims of the Holocaust organized by the U.N. The screening will be followed by a discussion with author Frank Blaichman, former Jewish partisan commander and Bonnie Gurewitsch, Archivist/Curator, Museum of Jewish Hertitage - A Living Memorial to the Holocaust. The U.N. is promoting JPEF's study guide "Women in the Partisans" to coincide with the film to 30 U.N. centers around the world including Kenya, India and Georgia. To access these resources, see below. "Learning about the Jewish partisans is a vital element of Holocaust education. Resistance is a perfect example of what the United Nations Secretary-General Ban Ki-moon called in 2010, 'a triumph of the human spirit [and a] living testimony that tyranny, though it may rise, will surely not prevail.'" 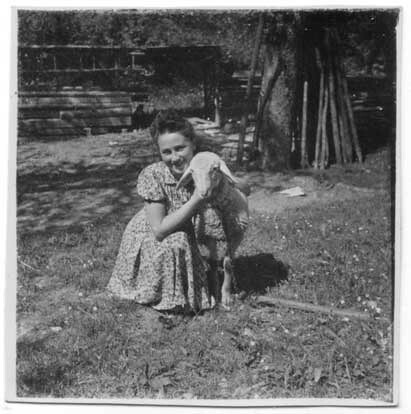 --Melanie Prud'home from the Holocaust and the U.N. Outreach Programme. 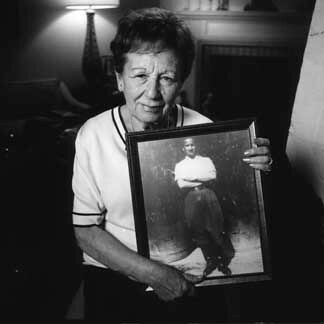 JPEF's traveling photography exhibit, "Pictures of Resistance: The Wartime Photographs of Jewish Partisan Faye Schulman", is in Cape Town at the Cape Town Holocaust Center through February 3rd. 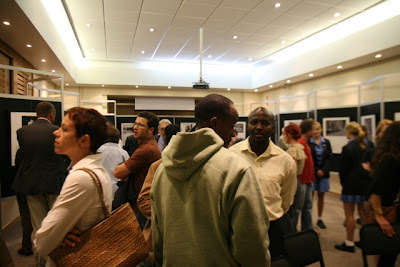 The exhibit will travel to Johannesburg and Durban over the next two months. JPEF's executive director, Mitch Braff, will accompany the exhibit, conducting teacher trainings and speaking at public events, including the U.N. Holocaust Memorial Day Commemoration ceremony in Cape Town on January 26th and in Durban on January 30th. 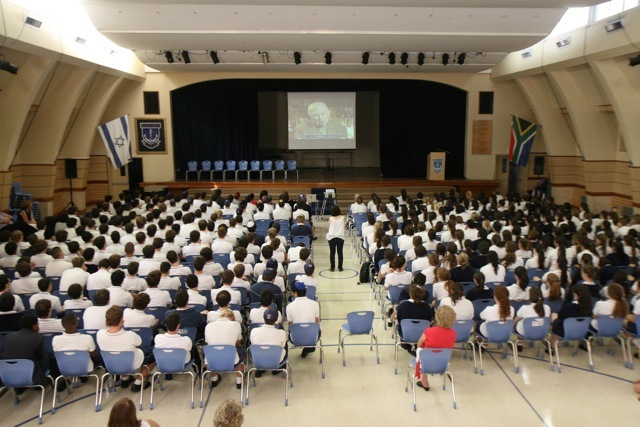 South Africa has a nationally-mandated Holocaust education unit for 9th and 11th grade students. JPEF materials will soon be a valuable addition to these educators' curricula. Check our blog in the upcoming weeks for more stories, photos and videos from Mitch's trip to South Africa. See Faye Schulman tell the stories behind her pictures, as well as photos from her exhibit, and a printable biography at www.jewishpartisans.org/fayesbio. Jewish Women in the Partisans resource page: films, study guides and women partisan profiles and more at www.jewishpartisans.org/women. Short Films: "Everyday the Impossible: Jewish Women in the Partisans" and "A Partisan Returns: the Legacy of Two Sisters" at www.jewishpartisans.org/films. Study Guides and Poster: "Women in the Partisans," Gertrude Boyarski, Sonia Orbuch and downloadable Eta Wrobel "RESIST" poster at www.jewishpartisans.org/resist. The partisans depended on the forests to evade from and combat their enemies, as well as endure the brutal winters. JPEF's "Living and Surviving" study guide and short film make great additions to your Tu B'Shevat activities this week. On January 14, accompanied by filmmaker Sharon Rennert -- Tuvia Bielski's granddaughter-- JPEF staff, provided the keynote address for the opening reception of Pictures of Resistance at the University of Washington Hillel. The following day, in conjunction with the exhibit, JPEF led a "Women in the Partisans" teacher training for dozens of area educators. 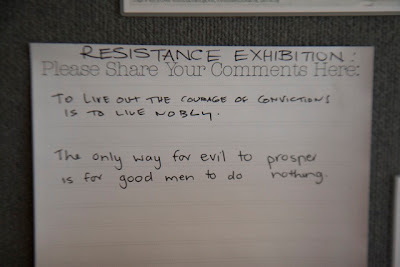 Pictures of Resistance at University of Washington Hillel, January 14, 2011. A teacher reflected that "one of the strongest themes that flows through my curriculum is the power of the human spirit. I connect this to all historical events studied in my 8th grade class. 'Women in the Partisans' will be a perfect addition to my Holocaust unit." To bring the Women in the Partisans and other JPEF workshops to your community, please contact outreach@jewishpartisans.org. We have released a new poster -- featuring Jewish partisan Zus Bielski. Zus was one of 12 children, and with his brothers Tuvia, Asael, and Aron Bielski formed the largest all Jewish partisan group. The group had 1,200 members and today, there are 15,000 - 20,000 decedents from the Bielski Brigade -- alive today because of Zus and his brothers. Zus was featured in the film "Defiance" directed by Edward Zwick and played by Liev Schreiber. The poster reads, "Zus Bielski and his brothers fought against the Nazis and saved more than 1,200 lives" and was poster was designed by Chicago based designer Eric Triantafillou. Download a PDF on the JPEF "Defiance" page here. If you are interested in a t-shirt of this image, please write rachel@jewishpartisans.org. 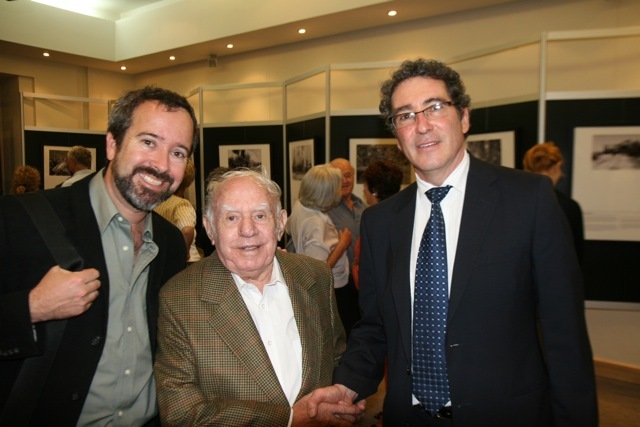 On Thursday, January 13th, JPEF's Executive Director, Mitch Braff will speak at the Opening Reception of "Pictures of Resistance: The Wartime Photographs of Jewish Partisan Faye Schulman". The reception runs from 6:30 PM to 8:30 PM (PST) at Hillel, University of Washington with the Washington State Holocaust Education Resource Center (WSHERC). On January 14th (8:30 AM - 3:00 PM PST), Braff and Tuvia Bielski's granddaughter, Sharon Rennert, are featured speakers for a teacher training. JPEF's "Women in the Partisans" training will accompany Rennert's "In Our Hands: A Personal Story of the Bielski Partisans." "Pictures of Resistance" will run at UW Hillel until February 17. Yesterday was Jewish partisan, Jeff Gradow's 86th Birthday. During World War II, Jeff was forced to take refuge in the forest when the Germans launched Operation Barbarossa. 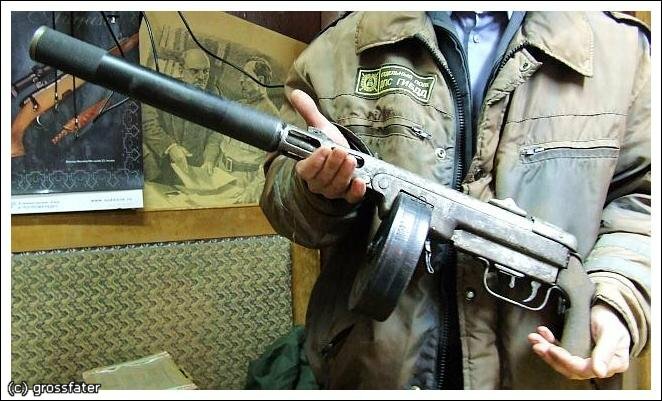 Years later the Soviets would air drop supplies and weapons to his partisan group. This help allowed the camp to launch guerilla attacks on nearby German soldiers. In 1944, his partisan group was absorbed by the Red Army. Jeff eventually moved to the United States where he still resides today. As a JPEF partisan, we feature Jeff's story and images on our website. Click here to read more about Jeff.